Actor and orator, Chief Dan George; his rise to fame and his legendary speech that galvanized a nation. 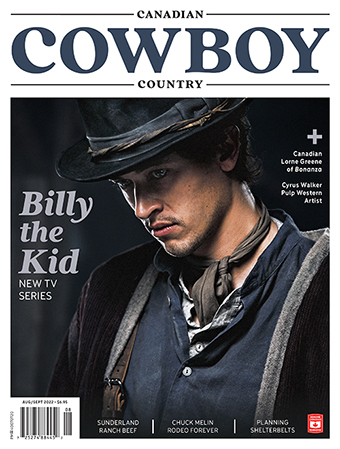 You can read the whole article in the current issue of Canadian Cowboy Country magazine. To subscribe, click here or call Marie at 1-800-943-7336. As Canada’s smash hit television show beams around the world, the men, women and remuda celebrate their record-breaking season. Working cow dog competitions have been around forever, but now the sport has a new name. From high in the Chilcotin range to the vast prairies, ranchers speak about calving on their outfits. We welcome the voices of the masters of the traditional cowboy arts as they speak about their craft in this six-part series. Preserving the range, protecting water — and why millions owe Cochrane’s WineGlass Ranch a big ol’ thank you. The country’s premier Western art show. A poem by S. Omar Barker.